VW previewed its autonomous tech ideas with the Sedric concept. 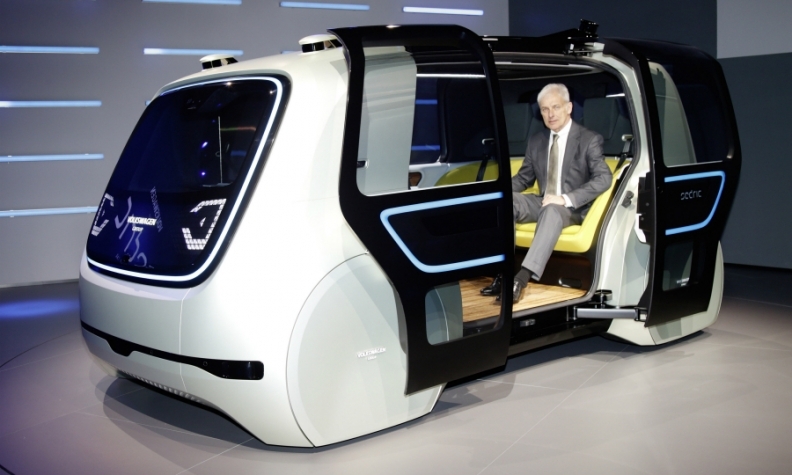 VW CEO Matthias Mueller is pictured sitting in the vehicle at the Geneva auto show. SAN FRANCISCO -- Silicon Valley start-up Aurora has announced partnerships with Volkswagen AG and Hyundai Motor Co. to develop a self-driving system, the latest tie-up between global automakers and Silicon Valley tech companies. Aurora was founded in 2016 by robotics expert Drew Bagnell, Chris Urmson, who came from Alphabet Inc.'s Google, and Sterling Anderson, who formerly worked at Tesla Inc.
Aurora and Volkswagen said they had been working together over the past six months to integrate Aurora's sensors, hardware and software into VW's electric vehicles to develop self-driving ride services in cities. In a statement, Volkswagen said the self-driving technology can be integrated over time across the automaker's brands and in different product categories, whether self-driving pods, shuttles, delivery vans or self-driving trucks. For Hyundai, Aurora's technology will be incorporated into custom-developed models and tested in markets including China. Hyundai said the first model to be used in testing will be its latest generation fuel-cell vehicle, debuting at the CES technology conference in Las Vegas next week. Under the alliance, Hyundai plans to commercialize level 4 autonomous vehicles -- which can operate without human input or oversight under select conditions -- in unidentified "pilot smart cities" by 2021. A company spokeswoman said Hyundai has "various collaborations" under way in self-driving technology and would continue to pursue cooperation. Urmson said that while each carmaker partnership requires close collaboration to integrate the self-driving system, the technology is "quite transferable" between vehicle models and manufacturers.